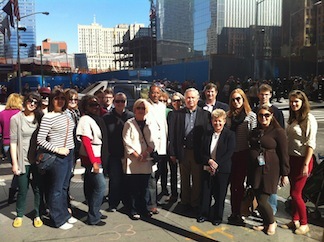 Alabama alums experienced an exclusive tour of the country’s principal institution for examining the events of 9/11. NEW YORK -- The Greater New York Chapter took the opportunity to experience one of the most memorable moments in American history with a group tour of the National September 11 Memorial & Museum. A group of 26 Alabama alumni, friends and family, which included Culverhouse College of Commerce Dean Dr. J. Michael Hardin, came together to witness firsthand the rebuilding of the World Trade Center and the lower Manhattan skyline and be among the first 5.3 million visitors to the Memorial since it opened last September. Many in the group were immediately taken in by the scale of the Memorial's twin reflecting pools, which sit within the exact footprints where the Twin Towers once stood. The Memorial’s pools are each nearly an acre in size and are the largest manmade waterfalls in the North America. Led on the tour by Alabama graduate Sarah Lippman, who serves as Communications Manager for the 9/11 Memorial, the group explored the eight-acre Memorial plaza and studied the seemingly endless names listed at the Memorial as the tranquil sound of water spilled over the pools’ edges into their center voids. "It was an honor to have a group of Alabama alums, especially Dean Hardin and his staff," Lippman said. "As I said at the Memorial, we have welcomed more than five million people since we opened last September, but for me, this was one of the most meaningful visits yet. To have a group like ours come together in memory and in honor of those lost on 9/11 is what the Memorial is all about."